Friday, January 22, 1960, 10 PM EST on CBS. Oh sure, women get to be 27 years old. This is a genuine thrills-and-chills episode, with multiple jump scares. They got me! But a jump scare is just a buzzer. If it feels like more, it’s because of fear that has already accumulated, set free by the shock. Something has to have primed the pump. So what’s the underlying fear here? Nan travels away from her accustomed people and places, into the wide-open country of being an individual, alone. In this realm, she is fundamentally confident and relaxed, as we see her in the opening scene, but she gradually becomes aware of a vague fear of a vague other. As with all ghost stories, this is a depiction of a real-life sensation: the social circuits misfire when there’s no one around, creating an eerie afterimage — specifically, the afterimage of one’s social defenses. In other words, she lets her guard down, and then begins to experience residual anxiety about how risky that is. She wants to be rid of the anxiety, so she tries to get help from other people, but of course by definition other people can’t help her with her experience of being alone; only she can make peace with her asocial core. In the end, she does: she accepts that to be truly oneself, alone, means allowing the social self to die for the moment — which is to say allowing oneself to have died in the eyes of others. Having done this, she now recognizes that the spooky “other” who has been menacing her was only her own projection, and calmly reintegrates him back into her zone of selfhood, within her car, her innermost privacy. He says she’s going his way, and of course she is. Read this way, it’s actually an entirely happy ending. The threat it seems to hold over our heads is that she’s “really” dead, permanently, and will never be able to be with other people again. But that’s not what the show actually tells us. She’s still sitting up and driving a car at the end, after all. The sense that she has met her doom is something the audience imposes on this story from their own phobias, which warn that once you’ve completely detached from society, even for just a moment, there’s no coming back. It’s not so, of course, but the phobia is common and runs deep. Even in the most literal-minded viewing of this episode, the audience understands that only Nan can see the hitchhiker; he is in her reality but not the mechanic’s or the sailor’s. This is a standard ghost-story conceit. Well, all it takes to get from there to my psychological reading is to consider that the revelatory phone call at the end might be in the same category. After all, the phone call is certainly “uncanny,” so we have to wonder about its status in relation to the “only she can see it” rule: what would it have look liked to the other characters? We don’t get to see the scene from anyone else’s point of view, but we can imagine that perhaps the sailor might have seen Nan standing by a payphone in a trance, not dialing. Or having an ordinary conversation with her mother, but with a glazed look in her eye. Or just sitting in her car. Whatever. The point is just that if you are willing to allow that “being informed that she is dead” might be just as much her private burden as the invisible hitchhiker is — just as exclusive to her reality — then it becomes quite natural to see them both as elements of her psyche, and with the values I’ve outlined. Almost every story of the supernatural will at some point tease the audience with the possibility that the spooky phenomena are only the protagonist’s subjective hallucination. “Is it real or is it just in the character’s head?” is almost as fundamental to supernatural stories as “who done it?” to mystery stories. But of course, the whole thing is always in our heads. This may seem absurdly obvious but it bears attention. The value of any story, for the audience, is exactly that we experience it even though it’s not “real.” And our emotional access to the characters is always through the lens of subjectivity; we relate to their experiences as experiences. How else are stories about ghosts and magic and monsters and aliens even comprehensible? The fact that we are able to make any sort of meaning of such things is proof that these things exist for us; i.e. that they correspond to elements of our perceptual complex. And so any attempt by an author to decisively resolve the “is it real” question is going to be beside the point. The ambiguity, the equivalence, is the point: ghosts are in our heads, which means they’re real. That’s how stories work, and that’s how heads work. That is to say: the received meaning of a story where ultimately the author says “it was real!” and a story where ultimately the author says “it was all in her head!” is absolutely exactly the same for us. And we’re the only ones here. The question of whether it’s the same for the character is just a hall of mirrors. If you have a puppet on your hand and you make it say “ow,” did the puppet get hurt? Obviously the truest, most correct answer to such a question is a shrug. That shrug isn’t evasive, or highfalutin’ relativism. It’s a shrug; the question merits it. If you’re sufficiently at ease with yourself, you’ll feel it. This is all, again, to defend my position that Nan is fine at the end of the episode. The voice-over talks about intense loneliness, about being “unspeakably, nightmarishly alone.” This seems mostly inherited straight from Lucille Fletcher’s original radio play, and not from Rod Serling’s psyche. Contrast Rod’s conception of loneliness in “The Lonely“: the character’s isolation is simple, absolute and unquestioned, because it’s been deliberately imposed on him by other people. The entire barren asteroid is a manifestation of the hostility of his jailers; the whole landscape has in this sense a voice of its own. It is the “other.” Fletcher’s “Hitch-Hiker” loneliness is more oppressive, is “unspeakable” and “nightmarish,” exactly because it is uncertain and incomplete, because it comes from nowhere and nobody is in charge of it. It’s sticky and existential; it has nothing to say for itself, but it still has the echoes of other people floating around in it. That’s what it is to be truly alone. In fact maybe it would be best to make a distinction between “loneliness” — i.e. the desire to be around other people — and being “unspeakably, nightmarishly alone,” which is an unpleasant sensation but not necessarily a desire. Nan turns to other people for help but it’s just an expression of desperation; the thing she really wants isn’t people themselves. She wants in fact to be more purely free of them. So I shouldn’t have said this episode is about “loneliness”; rather, it’s about “being alone.” The condition of being alone can give rise to fears, but the fears aren’t always of the condition itself. This episode is about the other fears that live in that space. There seem not to be any recordings of the first performance of the radio play on The Orson Welles Show in 1941, but Welles brought it back several times, and later performances have survived (including this 1942 version for Suspense and this 1946 version for The Mercury Summer Theater of the Air). The most obvious difference from the Twilight Zone version is that the radio play has a male rather than a female protagonist — played by Orson, naturally. Your mileage will vary as to whether this feels like a consequential change. This flourish is more truly “weird” than seems to have been Rod’s taste; it lunges outward toward profound disintegration. Whereas The Twilight Zone is committed to an aesthetic of cleverness, tidiness. The Fletcher ending doesn’t really work for me — the cadence of it, unfortunately, is too much of a cliché for my ear to take seriously — but I recognize that there’s a real idea behind it, not just a stock gesture. The fear of social death — the idea that if one is not observed one will cease to be oneself — here is thrust wriggling in the audience’s face: it’s devouring this guy right as we listen! It will devour you! If he’s not “alive” anymore, not “Ronald Adams” anymore, who… is… he? The essence of “the weird” (in the Lovecraftian sense) is, I think, fear of the fact that consciousness — the experience of a self and of a world — is an illusion, prone to dissolution. For those of us who feel it, it can be the most potent and profound form of fear. But it’s really just like any other phobia: a morbid exaggeration. There’s nothing actually dangerous about the fact that consciousness is an ever-dissolving mirage — that there isn’t really any such thing as “I.” The mail still gets delivered, etc. And Rod Serling, for all his insecurities, was not afraid of dissolving. That wasn’t his burden. Like I said, he seems to have been afraid of loneliness, but not afraid while actually alone. I suspect he couldn’t really comprehend the fear behind the “weird” Fletcher ending because it’s wasn’t his fear. So his reworking of The Hitchhiker into something tidy, something that made sense to him, inadvertently does the audience a service that the original doesn’t: it reveals the solution to the phobia, which his subconscious already knew, as does the subconscious of everyone who isn’t phobic. It’s the same as the solution to any phobia: it turns out you misunderstood the situation. It’s not something perpetually lurking in wait for you, somewhere beyond the horizon; in fact, it’s already in your car. It’s been with you all along. It’s “going your way.” It’s you. Duh. • I love that the first appearance of the hitchhiker not only isn’t foregrounded but isn’t accompanied by any music, either. He’s really just ours to notice and worry about privately, feeling that even “the show” doesn’t know we saw him there. • She says she’s going from Tennessee to Arkansas but she also says she’s on Route 80. Rod was probably looking at the map of Route 80 but his eye skipped down to Route 40. • Mom’s phone number: Trafalgar 4—1098. According to this chart, TR(afalgar) was a Manhattan exchange and translates to (212) 874-1098. Today, according to various reverse-lookup services, this is not a listed number. Suspicious, right? • Eleanor Audley — Cinderella’s stepmother and Sleeping Beauty’s witch — is the uncredited voice on the phone. • Psycho had begun shooting on November 11, 1959, and would wrap on February 1, 1960. (“The Hitch-Hiker,” for what it’s worth, had been shot July 28–30, 1959.) I can’t find a more detailed breakdown of the Psycho production schedule — I’m sure it’s out there somewhere — but it seems entirely possible that Hitchcock had seen this episode recently when he was shooting and/or editing the driving sequences. Something else in common with Psycho is of course music by Bernard Herrmann. This is a library score, assembled from various existing recordings, but the principal material used is, aptly enough, the score Herrmann wrote for the original 1941 production of the “Hitch-Hiker” radio play (and reused faithfully in the extant recordings linked above), which had been re-recorded for the CBS TV music library as general-purpose underscoring. Here it just happens to be having a reunion with its original subject. It should be here noted for those who are unaware that Lucille Fletcher, author of the play (and of Sorry, Wrong Number), was from 1939 to 1948 Herrmann’s wife, so this material is in a sense doubly linked to Herrmann. In fact the whole thing was inspired by a cross-country drive Herrmann and Fletcher made in 1940, heading to LA so that Benny could work on Citizen Kane. Unless you’re in a very particular mood, his “Hitch-Hiker” score makes for rather drab listening in isolation, but that’s exactly why it’s so exemplary of his unparalleled craftsmanship in the art of musical furniture-making. This is music like perfectly-milled unfinished wood. No melodies, no form: pure. And yet the drama is served with great sensitivity, both in its whole and in its each individual moment. That said, its ultimate fate as a venerable piece of library music — cropping up on Gunsmoke and the like — demonstrates that a really good piece of furniture, though it might have been designed to match one particular room, will work anywhere. Inger Stevens. This was my first thought, because it’s Inger Stevens. She was “The Farmer’s Daughter” on the TV show of the same name. So pretty–and those dimples. She had a sad life story though (Bing Crosby is the villain of that story, even if Wikipedia doesn’t tell you so. My mother read the movie magazines of the time so she knew the real poop), so that factored into my watching of this episode, along with knowing I had seen it way back when. 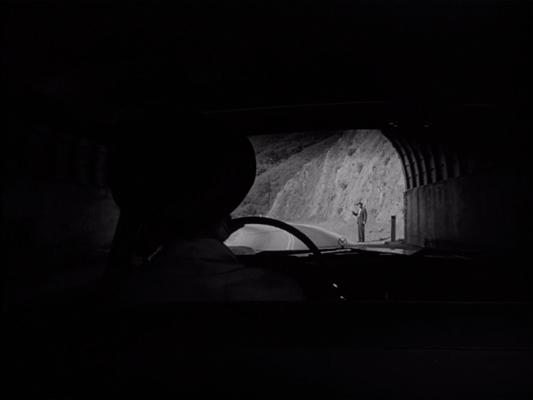 I remembered it wrong, though; I thought that irony was that her FEAR of death/the hitch-hiker actually CAUSED her death; that is, trying to avoid him would cause her to drive recklessly (as it did) and make her, finally, drive herself into the accident that would kill her. But that’s not how it was. And yes, I thought it was just simply that he was “death.” Though I think I have accumulated all the stickers that should have earned me a decoder ring by now, I still don’t know how to operate it. I have no argument at all with your decoding and analysis; thinking of him as “death” is terribly simplistic, though probably enough for the majority of Serling’s audience. I do believe that Serling saw more that that, though I doubt that he could have elucidated it as well as you have. Regarding “Oh, sure, women get to be 27 years old”: I believe the mock indignation should actually be on the other foot. I think all these TZ characters are meant to be in the prime of their adulthood, and right on the “outer limit” of it, if you will. A man can be in his prime up until he is 36; but, alas, a woman has run out her options at 27. 3. I’m not saying thinking of him as “death” is wrong or simplistic. I’m just pointing out the obvious: that to say that a person onscreen “is Death,” or that an experience a character has while remaining conscious, sentient, upright, etc. is “being dead,” is a conceit, a convention. These things are nothing like actual death. And of course nobody in the audience has ever died so that can’t possibly be what we’re relating to, emotionally. Underneath, we’re having some other kind of experience, making some other kind of sense of what’s going on, which we then conventionally call “death.” I’m just trying to tease out what it is to us before we give it that name. But yes, that’s clearly the name of it. 4. Right, I was taking the feminist objection as a given, which is why I thought it would be sort of funny to go straight to the inverted version. At the same time, I’m serious in suggesting that the inverted version might be an equal and opposite critique of the same underlying bad faith. Alas, I have a very hard time guessing which things that are in my head will be understood if left unsaid. Basically my writing process for these is that I immediately write a very concise version of the whole thing in a wry telegraphic style, and feel proud of all the complexity of thought that I’ve so brilliantly encapsulated in such a tiny space. Then I go back the next day and reread it and realize that all the complexity was just in my head, can’t possibly be assumed of the reader, and isn’t remotely implied by my words — not even to me, the same person one day later. So what I thought was a finished virtuosic performance turns out actually just to be an outline, and not even a very clear one at that. Then I spend many laborious hours trying to write down all the stuff that I had originally believed could and should go without saying. In the process I end up cutting my ambitions way back because it’s just exhausting, and I never end up satisfied because the worry that “maybe this still needs further clarification?” can go on forever. It’s a drag because I’m always proudest of what I’ve done right at the start; the more work I put in, the less I identify with the style. But the work is clearly necessary. Anyway, “Oh sure, women get to be 27 years old” is an untouched remnant of the way the first draft always sounds. Trust me, it’s brilliantly multilayered, just like every sentence in a dream is brilliantly multilayered. Until you wake up. I write like a dream! 4. I am the one who should have gone back to read her writing a day later. The multi-layers seem embarrassingly obvious to me now, and I missed them in an over-eager attempt to post a comment within minutes of a hurried viewing and reading. 1. I know. Her life story still seems threaded with emotional damage wrought by co-stars, though. And there are plenty of other stories to make Bing Crosby out as a jerk. Also, Hollywood legend imprinted at an early age is hard to shake off. Try to convince me that I don’t know the real scoop on Elizabeth Taylor and Richard Burton during the filming of Cleopatra.